Music is the raison d'être of dancing, and in couple dancing it is also an important synchronization tool. To mark my 20th year dancing tango, I have come up with 20 things I have learned in, through or about this wonderful dance and its enthralling music. Here is my next "lesson." Musicality just may be my favourite subject. It is certainly my favourite quality in a dancer … well, perhaps tied for first place with a good embrace. Give me a nice embrace and great connection to the music and I am a happy dancer. Musicality is probably the most underestimated aspect of tango dancing by most beginner to intermediate dancers. From Day One, just about every leader wants to learn steps, steps, steps and moves, moves, moves. While of course cool and complex steps can be fun, they are nothing if not executed in connection with the music. Better to execute something simple in perfect time to the rhythm than something seemingly complex while treating the music as simple background noise. I think the same phenomenon appears in every social dance. I recently went out to a salsa club for the first time in over a decade, and I found that more than ever dancers are focused on moves. They turn you this way and that, executing series after series of complex figures, rarely if ever pausing to just dance. To just feel the music and move to it. In tango, as in salsa, complex sequences and difficult moves can be fun and satisfying when expertly executed, but there needs to be some simple dancing in between, and if the execution is not expert, if either partner is off the music, it's disconcerting to the other, and, frankly, barely any fun at all. For the follower, it means you are constantly receiving two conflicting messages – one from your partner and one from the soundtrack – and you therefore constantly have to choose which of the two you are going to follow. A woman once confessed to me that when she is in this situation she feels like her brain is about to explode – and I feel the same way. Music is pretty much the raison d'être of dancing. It is why we dance differently to different types of music. So why oh why do so many tango dancers treat musicality as an after-thought? First, there is no basic step in tango. In most social dances there is a basic step that fits a specific rhythmic pattern and generally fits cleanly into a musical phrase. To again use salsa as an example, you have three steps, a pause, then three more steps and a pause, all of which fits perfectly into an eight-count phrase. So the basic step is taught that way: as a pattern that starts and ends in time with each musical phrase. In tango there is no real basic step besides the walk, so you are not obliged to start a sequence on "1" or finish on "8." Even if we do use some sequences as part of our vocabulary – and some of those might even contain exactly eight steps or actions – we can change the rhythmic pattern by pausing a beat or two or dancing double-time, thereby changing the place in the music where we complete our figure. Add to that the upredictability of our partner's responses and the traffic on the dance floor, and it becomes impossible to impose any type of sequence with a specific step count or musical count. Second, tango music is so layered that there are many ways to interpret and play with it. This makes it hard for teachers to impose a musical structure on their students, because so many other musical structures might work just as well: quick-quick-slow vs. slow-slow-slow or slow-quick-quick, not to mention adding pauses or syncopation. … But I think teachers do need to pick one pattern and impose it at first, as an exercise in awareness and discipline. We need to train students to force themselves to dance to the music, consistently keeping time with the beat. Because so many just don't. They figure they will worry about the steps first and deal with following the music later. But often that "later" never really comes; they get so used to dancing to the beat of their own drum – or ignoring it altogether – that they never learn to let the music that's playing lead them and inspire them. •Pauses and double-time. In terms of variation on the beat, pauses will come first, as you often will have no choice but to stop moving for a beat or two to get your bearings or let your partner get his or hers as well as to manage the always unpredictable dance-floor traffic. Just be sure you do pause for a beat or two or three – not some random time that ignores the music. Pause on a beat and start again on a beat. Double-time dancing, sometimes called traspie (especially in milonga) or contratiempo, means dancing twice as fast, or, in other words, doing three steps in two musical beats. This is where things get interesting … and, of course, more challenging. Just remember, if you can't yet stick to the time, you won't be able to handle double-time. •Syncopation, phrasing and dancing the melody. These are more complex concepts. For high-level dancers they are incredibly fun, because you can get incredibly creative, but they are also quite difficult. Many dancers never get to the point where they can use these elements, and you absolutely need to fully master the previous concepts before even attempting to go further. Syncopation means placing rhythmic stresses or accents where they wouldn't normally occur; this would generally be done in a place where the musicians are doing it, so you have to hear it, get your feet to mark it and your partner to feel it, all in the space of a fraction of a beat. Phrasing is the way the music is grouped into structures. In tango, these structures will usually be 8 or 16 counts. In tango dancing, you do not have to "start on 1" the way you do in some other dances, but the music changes between phrases, so if you are aware of the phrasing and the changes you can also change the quality of your dancing in those moments, thus being more fully connected to and expressive of the music. Dancing the melody can be done by marking the intricate rhythmic sequences of one of the instruments as well as by dancing the feeling of the music. This is what will, or should, make us dance differently to different orchestras. Clearly, different styles of music invite different styles of dance. From the time my children were very young, I noticed that I could play any genre of music and they would instinctively move in a way that closely resembles the dances we all associate with that genre: country, swing, hip hop, classical … even if they had never heard the music or seen the dance before. Each style of music automatically evokes a different feeling and a particular way of expressing it physically. If we extend this concept to tango, it means that the feeling and quality of our dancing should change with each tanda, each style, each orchestra. Obviously waltz should be danced differently from milonga, which in turn should be different from tango, but within these different styles each orchestra should be danced differently as well. If you wouldn't move the same way to Tchaikovsky as to Eminem, would you dance a 1930s rhythmic D'Arienzo the same way as a dramatic Pugliese from the '50s? So, what about the follower's role in all of this? There is a mistaken idea that musicality is mainly the leader's job. But no, like everything else in tango, it should be 50/50. For one thing, it is the music that will inspire the follower's embellishments. Why do I choose a tap vs. a lápiz? A series of tiny, playful steps vs. a slow caress of my partner's leg? The music, of course! But also, sometimes it is my job to keep the time. For example, if my parter leads me a turn while he pivots on one foot, embellishing with difficult enrosques, it is up to me to mark the music with my steps, helping him to turn, keep his balance and easily keep track of where I am so he can end the turn at just the right moment. The music has another very important role in couple dancing: It is a synchronization tool. If my partner and I are both dancing to the same music, we will more easily dance in sync with each other. When we talk about going beyond the beat to dance double-time, to syncopate or to explore other layers of rhythm and melody, it is essential for the follower to be as in tune with the music as the leader. For example, when my leader wants me to dance double-time, he gives me a lead to go faster, but what tells me exactly how fast to go? The music! My leader doesn't place my foot on the floor; I do, and I do it to the music. And if he wants me to syncopate or mark a more intricate melodic pattern? Impossible if I am not hearing it in the music myself. If all of this sounds daunting, remember: Start with the basics, or the beat, and you will not go wrong. Little by little, as you begin to master one concept, you can attempt the next. Then maybe one day you, too, will embody the music, using your own body like one of the instruments in the orchestra, keeping time with the beat while filling the space in between with melodies full of creativity, emotion and suspense. So musicality might just be the most important element in our dancing. But then again, you do need steps. thank you Andrea, very interesting and well explained. On this topic my question is would you emphasize a particular instrument for the follower, I love to embellish on the violin sometimes or the bandoneon and leave the instrument which is playing the beat or not as the case may be to the leader. I have heard it said that the man, or leader, dances the piano and the woman, or follower, is the violin. I don't think it's that clear cut, though. I see no reason why the follower shouldn't choose to be rhythmic sometimes and the leader lyrical. I think it could be an interesting exercise in embellishment and musical expression to pick an instrument and try to dance it through a song, but in the end we can dance whichever instrument is inspiring us in the moment … without losing the beat, of course. Yes musicality is the most important aspect of dancing. After all it takes three to tango: the music and the two partners. 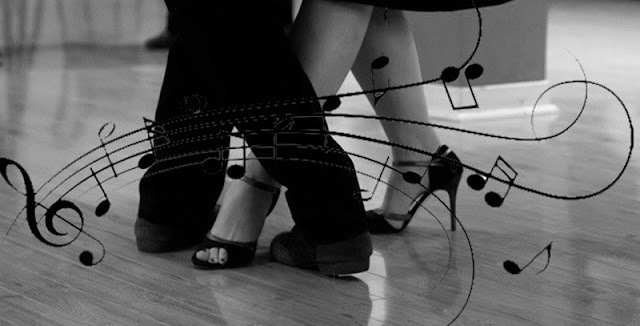 I derive great pleasure from dancing to good tango music but the contrary is also true. Unfortunately dull tango music is sometimes played in milongas..... Thanks from underlining this aspect. Thanks for commenting, Sohel. Certainly we will derive more pleasure from dancing to music we like than music that bores us … but that is subjective. What you might find dull someone else might adore, and vice versa. And sometimes our tastes change. There are orchestras I found uninspiring five years ago that I have grown to love as I re-listened and discovered layers and subtleties I hadn't noticed at first.